Meet four distinct nations Lithuania, Latvia, and Estonia, visit Helsinki, the capital of Finland and explore the imperial riches of St. Petersburg. You will admire the Baltics, with their live culture, picturesque nature, beautiful capitals - Tallinn, Riga, and Vilnius, get acquainted with what Helsinki can offer and be amazed by the magnificence of St Petersburg. The Baltic countries - Lithuania, Latvia, and Estonia will capture you with their remarkable history: Medieval Guilds, Teutonic Knights' castles and echoes of the nations' struggle for freedom. You will be taken back in time by their tangled, medieval, old town streets, cobbled stone squares, and churches and be amazed at how they have embraced the western culture and modern ways of life. Whether you are looking for the ancient history, unique architecture or the lively nightlife, these three incredible countries will offer you unforgettable experiences displaying their hidden treasures of unknown Europe. In St. Petersburg you will experience the white nights and one of the most beautiful historic cities of Europe: the magnificent Catherine’s Palace, Peter & Paul Fortress, the Winter Palace and the exceptional Hermitage Museum. The city is known as the Paris of the North and has a vast cultural atmosphere. It will stun you not only with the unique Russian style architecture but also inspire with world-famous ballet performances. St. Petersburg has so much for everyone to admire: relaxing in its beautiful parks or visiting world-class museums and art collections. 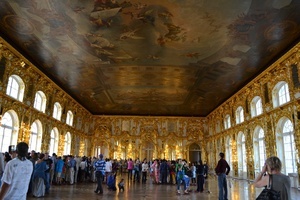 Escorted group tours combining Baltics and St Petersburg offer you incredible cultural and historical travel experience. Starting in Latvia, this tour explores its capital Riga and continues to Estonia driving through Baltic countryside, from Tallinn we take a ferry to the capital of Finland Helsinki and on to Russia's famous St. Petersburg. Visit four countries in one trip! Estonia, Finland, and Russia – a perfect combination of countries around the Gulf of Finland. In Tallinn, explore an amazingly preserved medieval architecture, visit Lahemaa National, continue to the Finnish Capital, Helsinki, and finally to the imperial St. Petersburg with its glorious palaces and museums. Starting in Vilnius, explore the capitals of Lithuania, Latvia and Estonia and beautiful Baltic countryside. Continue to Helsinki, the capital of Finland and on to the highlight of the trip St. Petersburg!